In 2018, we would hope that people would be moving away from hurtful racial or generalizing stereotypes, and toward acceptance of everyone, whatever their nationality might be. The marketing department over at Eataly apparently doesn’t agree, though, or perhaps just has an unusual sense of humor. The Chicago Tribune reports today that Eataly’s latest signage series refers to out-of-date and negative descriptions of Italians, despite the fact that the chain began in Italy, and was brought over to the U.S. by chef Mario Batali, who recently stepped away from the company due to sexual harassment charges. Interior store signs in the “Bring Home An Italian” series push wine (“Great Legs, Better Body”) and salami (“The New Hunk In Town”), adding weird sexual connotations to food, especially suspect in light of the recent scandals surrounding Batali. Eataly bosses wouldn’t say earlier this week whether they’d had customer complaints about a holiday marketing campaign that suggests—among other things—that Italians smell bad. It turns out they did but decided to ignore the problem on the advice of a public relations crisis company. 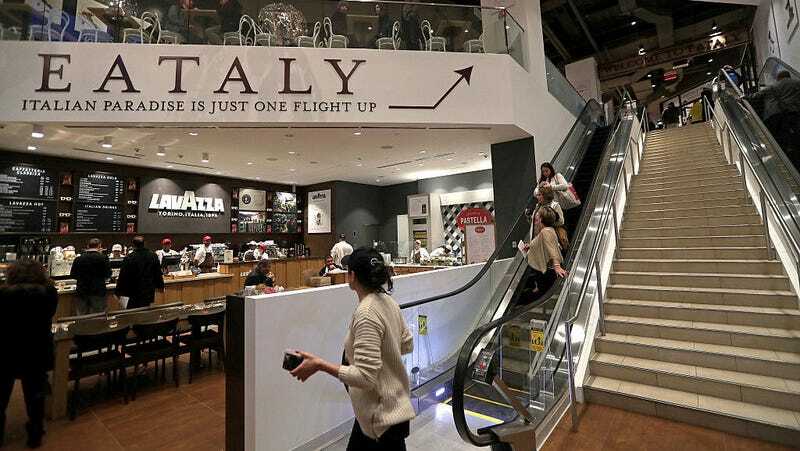 An internal email chain apparently forwarded in error to an angry customer by the upscale food market’s public relations and social media manager Sara Massarotto shows Eataly staff discussing how to handle the issue nearly two weeks before it blew up. Louis Rago, president of the Italian American Human Relations Foundation of Chicago, said in an email to the Tribune: “[S]omeone in the creative department of an ad agency [was] trying to be clever at the expense of an ethnic group whose culture has had such a positive influence particularly in the food industry… Whoever put their stamp of approval on this promotion should be fired.” You may think that Rago should lighten up, and some passers-by the Trib talked to clearly accepted the signs in the humorous manner in which they were intended. But it has taken decades for U.S. society to even attempt to get past silly mid-century depictions of Italians and many other ethnic groups; any references that call back to these unfortunate generalizations aren’t doing anyone any favors. So we’re falling on the “unfunny” side, Eataly.